In this week’s episode, Pastor Daniel talks about how leaders can encourage people to become actively involved in serving God through serving others. Jesus demonstrated this active service by washing His disciples’ feet. “If I then, your Lord and Teacher, have washed your feet, you also ought to wash one another's feet. For I have given you an example, that you also should do just as I have done to you.” (John 13:14-15) The idea of encouraging others to serve is a natural part of leadership. From Jesus’ example in Mark 3, Daniel shares practical ways to help us in recruiting and retaining people for ministry. Have the right attitude. Ask people personally. Give clear instructions. Lead by example. Explain the why of what we do. Be real. This is hard work. People need encouragement. Give them the word of God. Therefore, my beloved brothers, be steadfast, immovable, always abounding in the work of the Lord, knowing that in the Lord your labor is not in vain. (1 Corinthians 15:58) Show appreciation to your volunteers. Rely on God. “What we’re doing is impossible without the Holy Spirit. It is God working through us.” We have to be able to choose people and then depend on God to do the work. Pray and ask for the Lord to do it, for His kingdom and His glory. This week’s One Piece of Advice about shepherding your team comes from Dr. Warren Gage, who serves in Fort Lauderdale. Before we get started in today’s Leadership Lesson, we want to announce the second annual Refresh Conference here in Delray Beach on November 9 & 10, 2018. It’s Friday evening and Saturday of Veteran’s Day weekend. Cost: $50 for the weekend, including lunch on Saturday. We’re planning a time of encouragement for church leaders and their teams which is hosted by Redemption Church. Guest Speakers this year will be Pastor David Guzik, who is a longtime pastor and author. You can find his ministry at enduringword.com. Also speaking will be Jason Sanchez, Director of House of Blessing Orphanage in Bachiniva, Mexico (houseofblessing.org) More information is available on our church website at redemptiondb.com/conference. In this week’s Leadership Lessons, Pastor Daniel shares from his own experiences in event planning. An event is any time we gather together as a group. We want these events to be beneficial. “I’ve had my share of epic failures, but I want to learn from my mistakes, to get better, to improve.” Here are 10 principles for event planning. 1)Pray. Ask God for wisdom and vision. (James 1:5). 2)Have a goal/define success. What is the point of this event? (Proverbs 29:18) 3)Get others involved. Let people help. There are great benefits in working as a team. (1 Corinthians 12:21) 4)Listen. Ask for input. Brainstorm. (Ecclesiastes 4:9) 5)Traditions are great, but be creative. Try new things. (1 Corinthians 12:5-6) 6)Make the event worth the time and money. Communicate the why and how it can bring value to their life. 7)Pray for the people coming to the event, that they will be blessed. It’s easy to get so busy planning that you forget this step. 8)Communicate well. Make sure to communicate the details. Tell people what to expect. (Ecclesiastes 12:9-10) 9)Be flexible/adjust. “We want to act calmly when our plan doesn’t go the way we think it should.” Chuck Smith always said, “Blessed are the flexible, for they will not break.” 10)Follow up/evaluate after the event. Ask questions. What could we change to make it better? Do it while your team’s memory is fresh.God gives the grace to have a great event. “It’s a sweet privilege to be used by God in this way, to plan events and to bless people.” So those are the 10 principles of event planning. Now you take them and apply them in your own way in your own ministry, by the power of the Holy Spirit. It’s been a blessing to share them with you. In today’s One Piece of Advice, my friend, Robby Christmas, is going to talk about how it’s important to have a reproducible tool that you can share and pass on to other people. In this jam-packed episode, Daniel talks about the importance of planning your schedule. Good planning is part of good stewardship, of managing your time wisely. But you can’t do that unless you know what you’re supposed to be doing. That starts with understanding the will of God for your life. Ask God to show you that. Seek it out. Hebrews 12:1 talks about the sins that “easily entangle” us. We need to be vigilant; we don’t want to be held back or tripped up by Satan’s schemes. “If God has told you to go left and you’re going right, that is not a very wise thing.” Then, based on what God has called you to do, what He says is valuable for you to do, plan your schedule. Implementing the plan is essential. Daniel shares a helpful tool for prioritizing your schedule by using four categories: 1)Important; 2)Unimportant; 3)Urgent; 4)Non-urgent. You will hear how he does it and how it can help you with your planning. God repeatedly reminds us in His word to make His priorities ours. Have an eternal perspective. Set your minds on things that are above, not on things that are on earth. (Colossians 3:2) Learn to say NO. This keeps you focused and productive. Go to God daily and set your schedule before Him. Then trust Him when things don’t go according to your plan. Be flexible, but schedule it. “What gets scheduled gets done.” (Michael Hyatt) Daniel walks you through his schedule to get an idea of what this looks like for him, including how to block your time and the invaluable practice of taking a sabbath day. And always remember Who your focus is; Many are the plans in the mind of a man, but it is the purpose of the Lord that will stand. (Proverbs 12:21) In this week’s One Piece of Advice, Pastor Lewis Williams reminds us of this very thing. In this episode, Pastor Daniel begins with a question to ask yourself: Am I doing the things God has called me to do? and offering practical advice on how we can hear and discern God’s calling for our lives. What does calling mean? In his book Leaders Who Last, David Kraft describes calling as “the God of the universe speaking into your life and circumstances, expressing His will.” Your calling is something specific. Ephesians 2:10: For we are his workmanship, created in Christ Jesus for good works, which God prepared beforehand, that we should walk in them. We all want to know what God wants us to do. We want to be fruitful. Knowing your calling helps you to stay focused, to endure hardship and pain when it comes. Jesus said to count the cost (Luke 14:28). The call to leadership will cost you. It is a life of sacrificial service. Knowing your calling starts with seeking God and knowing Him through His word and through prayer. You can’t know your calling without knowing God. Pastor Daniel gives four key areas to pursue this question of calling: 1)Character—Does your daily life and choices testify to your being a godly leader? 2)Competency—Do you have the skills and gifts to do the job? Are you currently using your gifts and skills to glorify God?. 3)Community—What does your community say about your calling? Seek the advice and counsel of your spouse and other godly people in your life. Listen to advice and accept instruction, that you may gain wisdom in the future. (Proverbs 19:20) Is your community confirming your calling or saying you’re not ready yet? 4)Circumstances—What doors has God opened and shut for you in your life? Behold, I have set before you an open door, which no one is able to shut. (Revelation 3:8) God knows His plans and purpose for our lives and He will accomplish that in order to expand His kingdom and bring Himself glory. Are your circumstances confirming your calling or telling you no or not yet? Closed doors may disappoint us, but we need to trust God. This is a long process and there are many layers of calling. But remember: You are the mission of Jesus. He loves you. Stay dependent on Him. Abide in Him. Be yourself. Discouragement can come from comparing yourself with others. In this month’s One Piece of Advice, Pastor Bryan Saylor talks about comparing. You’ll appreciate his encouragement. Pastor Bryan Saylor, Melbourne, Florida, shares his advice, which is really a warning against falling into the trap of comparing yourself to others. In the world we live in today with its frenzy of social media, it can be easy to see yourself falling short in some area of your life since there is always someone somewhere who is doing life or ministry bigger and better than you are. The enemy can use this trap to make you feel embarrassed or ashamed of your own life. A better church, a cooler idea, a bigger audience…a constant barrage of me vs. others. It can be extremely destructive. “Actively eliminate comparison from your life—be vigilant about that.” Jesus talks about this type of self-discipline in Matthew 5:30: “And if your right hand causes you to sin, cut it off and throw it away.” It is essential that we get rid of the things in ministry that are holding us back. Stand guard against the enemy of comparison and when you recognize it, destroy it. This book had a great influence on Pastor Daniel. Here’s one quote: “Make it your priority and goal to pour your life into future leaders.” More quotes can be found in the blog section of eeleaders.com. If you’d like to add some quotes of your own, please share them. 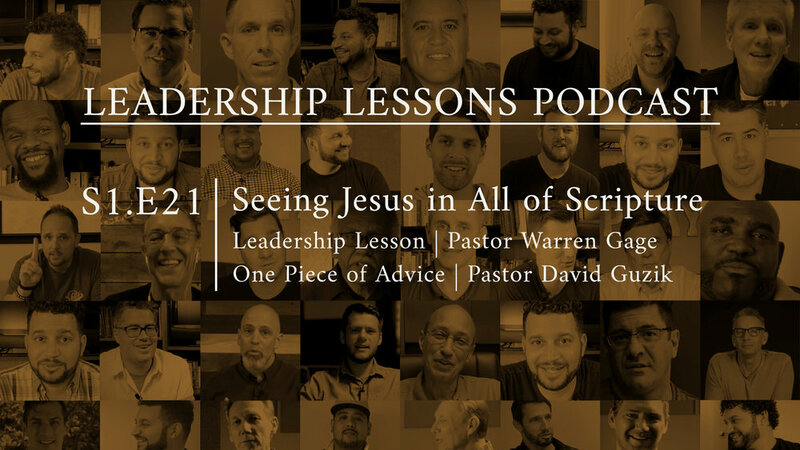 The What: Pastor Daniel Williams introduces his brand new podcast from EE Leaders with Leadership Lessons, Episode 1: The What & Why. Daniel shares his heart for this new ministry resource, having its origin growing up the son of a pastor. Seeing firsthand the impact of knowing and following God every day shaped this vision at an early age. Their family was raised with this foundation: “Jesus is real. The word of God is true. We’re going to live for Him.” Daniel gave his life to Jesus as a teen and began teaching the Bible at age 17. After seven years in full-time ministry in Olympia, Washington, God called Daniel and his wife, Laura, and their family to Delray Beach, Florida to plant a church in 2011. Redemption Church was born. The years since have only fueled Daniel’s passion for sharing Jesus and his heart for church leaders and for investing in others. “Through this podcast I want to encourage and equip you to serve Jesus, to know what a joy it is to serve Jesus and His bride. These are lessons I’m learning that I want to pass on, things I’m growing in still and learning from other people.” Episode 1 is the first of 24 podcasts in Season 1 that will be posted each Monday. eeleaders.com, the website, will include videos of the podcast for anyone to view, as well as a weekly blog and a monthly Recommended Book, and the newly released episodes of One Piece of Advice (posted on Fridays). These are short segments from pastors and other ministry leaders who will be sharing their one piece of advice for other leaders, featuring leaders from our local area, throughout the state of Florida, across the country and around the world. What a vast resource of wisdom and knowledge God has given us. There is practical wisdom, some doctrine, some theology. Pastor Neil Spencer, Destin, Florida shares what he learned from his own father who is also a pastor. “Family matters. Ministry that doesn’t start at home, doesn’t start.” This is the standard, that who you are in private is who you are in public. And who you are in public is who you are in private. God has called you to be one person, to be authentic, to be genuine, sincere. This is life-giving advice: Be the one person God has called you to be, no matter where you are.